A conservation group in Baltimore has employed this innovative water wheel, affectionalely known as Mr. Trash Wheel, to clean up the city's polluted Inner Harbor. In just 18 months, Mr. Trash Wheel has removed 350 tons of garbage from the harbor. That's nearly 200,000 bottles, 173,000 potato chip bags and a whopping 6.7 million cigarettes removed from a waterway so polluted that it failed its 2014 water quality report card. The clean energy-powered wheel is equipped with a conveyer belt; as the belt turns, garbage and other debris travel up the belt and are deposited into a dumpster and disposed of accordingly. This remarkable photograph shows just how much of an impact the water wheel has already had in its short life. 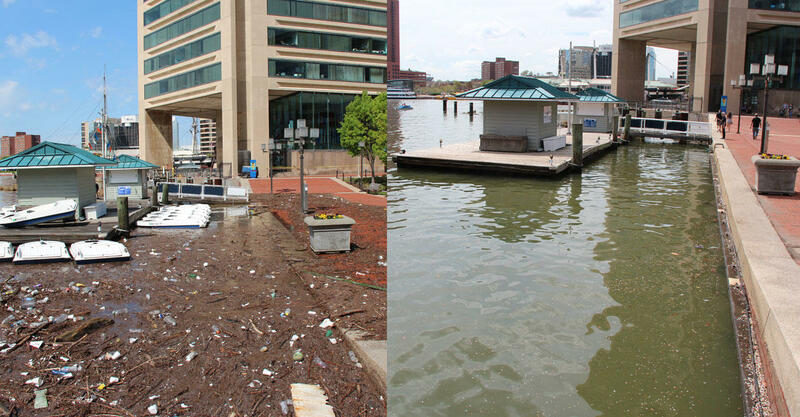 The photo on the left was taken on April 30, 2014, after a torrential downpour washed a harrowing amount of garbage into the harbor. Just over a year later, a similar storm earlier had almost no recognizable impact on the Harbor. The wheel, known as "Mr. Trash Wheel" on social media, is just one part of the Waterfront Partnership's Healthy Harbor Plan to make the Harbor swimmable by 2020. Click here to help fund the construction of a second water wheel-powered trash interceptor in Baltimore's Canton neighborhood.